How does it feel when people tell you how fortunate you are with your uncommonly high intelligence and your ease in accomplishing anything? Do you take your own mistakes very seriously? 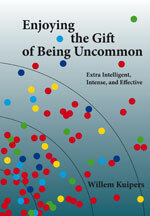 Do you think your own intelligence is more or less immutable, or do you think it can be changed by focused effort? Carol Dweck has been studying for more than twenty years how our mindset creates our world, shapes our goals, and influences our abilities to realize our intentions. There is some similarity with the previous subject of mastery versus performance, but mindset takes a different angle and brings new insights to interaction and thoughts about having uncommon intelligence. She discerns two basic mindsets: a fixed mindset and a growth mindset. In the following table I have listed some characteristic differences between the two. My intelligence and skills are hardly changeable. My intelligence and skills can be developed. Success is about proving you are skilled and intelligent. Success is about pushing your limits and growing by meeting challenges. Mistakes are a threat to your self-esteem. Find someone else to blame. Mistakes are an invitation to try again differently. Blaming someone is in no way an issue. My IQ-test measures my intelligence. My IQ-test is an indication of a specific skill at a given moment. When you’re smart, everything comes easy for you. By working hard you can transform your intelligence and skills. Suppose I fail while trying my best: I’d better not start at all. Work hardest for the things that really matter to you. Teachers are allies and guides. If the going gets tough, I quit. If the going gets tough, I get more determined to go on. What is the meaning of trying hard? People with a fixed mindset stop making an effort, while those with a growth mindset become more enthousiastic and persevering. Although this presentation of the two mindsets makes it quite attractive to try to use the growth mindset, in real life people often have a fixed mindset and even manage to induce others to switch to fixed mindset mode. Just giving them a certain kind of praise or compliments about their high intelligence does the trick, as Dweck time and again has demonstrated in all kinds of situations with all kinds of people very convincingly. While praising them for making an effort activates the growth mindset. Many XIPs have often experienced being praised extensively for their marked high intelligence. They also were congratulated for their capability of obtaining very high scores at school, practically without effort. For some of them, their obtained high IQ score felt comparable to a graduation in being uncommonly intelligent, plus the irrevocable obligation to behave accordingly. Fear of failure, apparent laziness, and not persevering under difficult circumstances, are well known complaints about the “underperforming” gifted. Could it be that this typical fixed mindset behaviour is for those children a natural reaction to being praised and labelled as gifted? Can a child have a low or a high susceptibility to this kind of praise? Could this also be the reason why so many adults and children alike resent being denoted gifted, because they somehow feel induced to taking up a fixed mindset, limiting their freedom to make mistakes or fail at a complicated task? Dweck argues that if you praise children or adults for their efforts instead, it is a completely different story. They like that too and it does not backfire afterwards, as it activates their growth mindset. It seems to me very relevant for XIPs and their environment to be aware of the effects that compliments and praise about the XIPs’ intelligence have on them. When compared to praise about some special effort they have made, it is far less effective. I expect, however, that one XIP may be more susceptible to it than another. Let us definitely try to avoid having a well-meant compliment backfire without being aware of it.